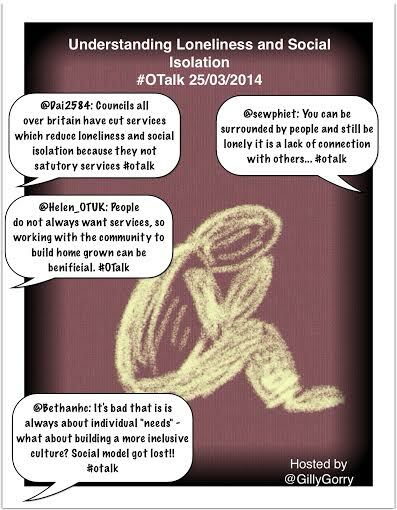 #OTalk 25th March will be hosted by me (@GillyGorry) We will be discussing loneliness and social isolation. How does this affect our service users, their families and caregivers? How can we help? What is the OT role? Evening #OTalk who’s online to join us tonight in discussing loneliness and social isolation? Evening #OTalk peeps. Hope everyone is well. #OTalk possible to be socially isolated but not lonely & socially included and lonely? #otalk is social isolation about face to face contact? Do we count online contact? With online people might have richer social life?? RT @smiffybrian: #OTalk possible to be socially isolated but not lonely & socially included and lonely? Wednesdays 7am look #OTalk #WeNurses #AdjunctChat all at the same time. Imagine a collaborative topic. And that’s only my timeline! I often C ppl bonding with carers & willingness 2 give up independence to keep carer #otalk shouldnt been a choice people have to make. @DebLants #otalk is one example that gives me that… Lol! @Helen_OTUK #otalk no one should ever ever say OTs shouldnt be aware of the political aspects of occupation. RT @Dai2584: @Helen_OTUK #otalk no one should ever ever say OTs shouldnt be aware of the political aspects of occupation.